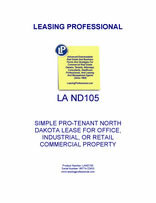 This form is for a single tenant North Dakota lease where the tenant has superior leverage. It gives the tenant the right to use the premises for "any legal use," and has very abbreviated remedies for the landlord in the event of a tenant default. It is also pro-tenant in character because of the clauses it does not contain which customarily appear in pro-landlord forms relating to remedies and a variety of other pro-landlord provisions. North Dakota is the most rural of all the U.S. states. Ninety percent of the state’s land is devoted to farming. North Dakota's total population is smaller than that of a number of U.S. cities. Agriculture fuels the economy, and the most popular crops are sugar beets, wheat, cattle and barley.